Every garden needs sunshine and water. And while we don’t have much control over what the sun decides to do on any given day, we find ourselves more responsible for watering our gardens. One of the main activities required for maintaining a garden is watering. And sometimes that’s the only activity that people actively participate in when they are growing something. 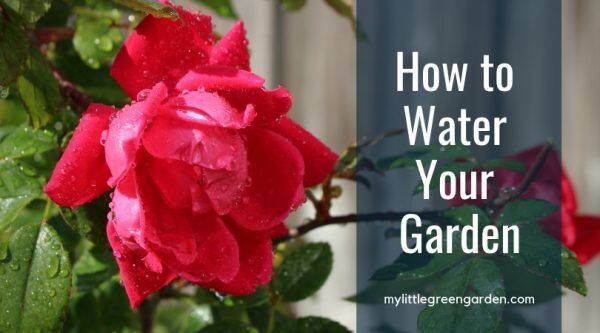 Watering your garden is important, but it’s also important to know how to water your garden correctly so that you’ll grow happy and healthy plants. The best time of day to water your garden is early in the morning. The temperature is typically at it’s coolest so there’s less chance of evaporation. Your garden will have time to dry before midday sun, while also being supplied enough water to get through the hottest part of the day. The next best time to water is in the evening, but it’s not recommended as much. When you water in the late afternoon or evening, your garden may not have enough time to dry before the sun goes down. This can leave the foliage wet, and create an environment that’s more likely to spread fungal disease. No matter the time of day, you should try to avoid watering the foliage of your plants, and instead focus on the base of the plant. Watering in the evening during the winter can also put your plants at risk for frost damage. When watering during the hottest time of the day, the water can evaporate before your plants have enough time soak it up. And your leaves can burn if they get wet. There’s a lot of vague information out there about how you should water your garden the appropriate amount without really quantifying what that is. “Make sure your plants get enough water.” Great. What does that mean?? A general rule of thumb is to water your garden 1-2 inches per week. This quantity, however, will vary depending on different attributes such as your soil type, what plants you’re growing, your plant’s current life cycle stage, and what time of year it is. It’s good to water your garden less frequently, but more deeply. Watering frequently can cause your plants to not develop as strong a root system as they could. Shallow watering and frequent watering do your plants a disservice by allowing them to remain weak. By adding a little bit of stress on your plants with less frequent watering, the roots will grow deeper. Stronger roots make for stronger plants. If your soil is sandy, it won’t retain moisture as much. This means there’s less chance of you overwatering, but also that you may need to water your garden more. If your soil is more clay-like, then there is a better chance of you overwatering, and you may need to water less frequently. While plants need water to thrive, they also need their roots to have oxygen, so overwatering can cause damage. To amend your soil texture you can add compost. Over time, the quality of your soil will improve. Organic matter can help to retain moisture, as does any sort of ground covering (mulch, straw, etc). Some plants require more water than others. Cabbage, cauliflower, celery, cucumbers, lettuce, spinach, melon, and squash all require a lot of water during dry spells. Tomatoes require consistent watering or they will split when watered more than they’re used to. Strawberries have shallow roots so they require more frequent watering. Some plants require more watering depending on what stage they’re at during their life cycle. Seeds, seedlings, and transplants all require additional water. Soil needs to remain moist during these more fragile phases in a plants life while roots develop. These should be watered lightly and frequently. Beans and peas need additional water when they start to flower. Tomatoes, eggplant, and pepper need additional water from flowering until harvest. Corn requires more water when tassels form and cobs swell. How often you water could be as seldom as 2 times a week or as often as 2 times a day. Typically I water once a day here in Florida. During cooler weather, I’ll water every other day (unless I have new seedlings or transplants). And during the warmest months, it sometimes ends up being twice a day. During the summer when temperatures are warmer you may need to water more frequently. During summer months in Florida, if you’re still growing during this season, may require watering 2 times a day – morning and late afternoon. If you water in the morning and by noon your plants are starting to wilt again you may want to water a second time. Using a shade cloth can also help protect your plants from wilting as much. If your garden method includes containers, then you’re going to want to water more frequently. Potted plants don’t retain moisture as long as other methods such as in-ground planting and raised bed gardening. The type of container you have can also play a factor. When watering, you can choose how actively you want to be involved in the day-to-day. You can water manually by hose or watering can. This is easier to do when you have a small garden or the time to spend with your garden. You can also set up a timer with a soaker hose, drip irrigation, or sprinklers. 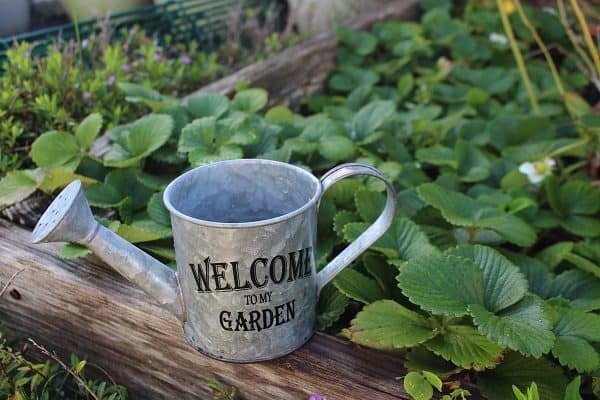 By using these methods you don’t have to worry about waking up early enough and setting aside the time to water your garden when life gets hectic. Work schedules can often create more of a challenge when making time to water. Whatever watering system you choose, it’s better if you avoid watering the foliage of your plants. Wetting your foliage can spread disease. Squash, cucumbers, and tomatoes leaves are especially sensitive to this. Watering cans are good for houseplants, seedlings, and other container gardens. They allow for a gentle sprinkling on seedlings which is especially helpful if you’re getting a head start indoors. These are great for very small gardens, but if you’re constantly refilling your watering can, you may want to upgrade to a hose (as long as your plants are outdoors 😉 ). 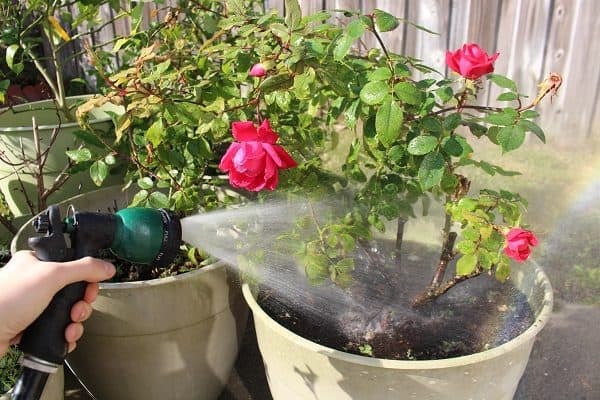 You can use a hose to water your garden. They sell wands that you can attach to your hose around 3 feet long to allow you to water at the base of your plants, without spraying the foliage, or hurting your back. Soaker hoses and drip irrigation are similar methods but still have some distinct differences. A soaker hose, pictured further below, requires less time to set up. A soaker hose is also fairly cheap. However, if a soaker hose gets a single leak, it’s easier to just replace the whole thing. The benefit of a soaker hose is that you only water the soil, not the foliage of your plants. 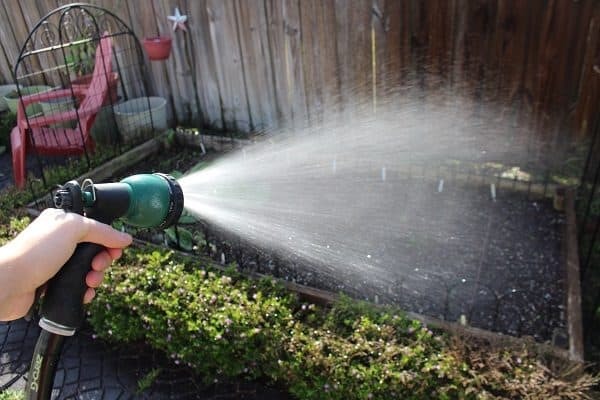 You can also attach a timer to your soaker hose so that you don’t have to spend the time watering your garden. Drip irrigations water your garden at the base, similar to a soaker hose. They are more durable and more precise when it comes to watering. They’re more expensive than soaker hoses and take more time for the initial set up. They’re easier to maintain if you get a leak. 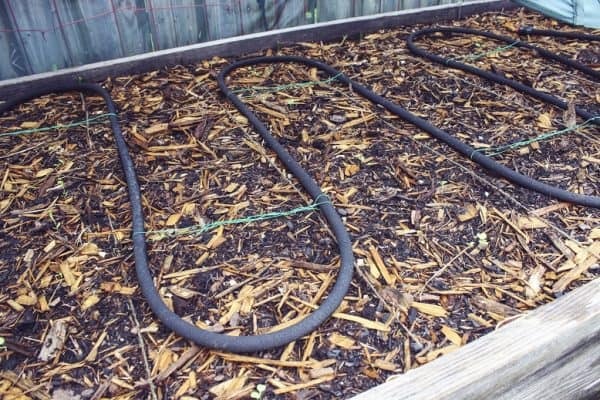 Drip irrigation is another method that you can use with a timer. Sprinklers are another method to water your garden. While sprinklers are better for lawns and large areas that require watering, I personally wouldn’t recommend them for vegetable gardens. This is because they can help spread disease by wetting foliage. 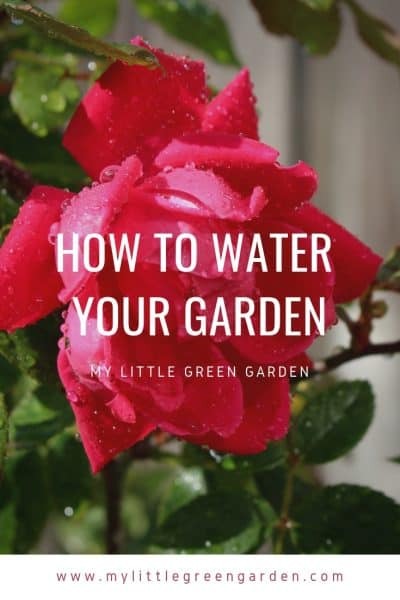 If you live in an area where water is a more limited resource or water is expensive, you may be interested in ways to conserve the amount of water you use in your garden. You may also be interested simply in what the most efficient way is to water your garden. The following are a few ways to conserve water. Mulch is a great way to conserve water. Having 2-3 inches of wood chips or straw can provide a ground covering that protects your soil. It allows for moisture to be retained, prevents weeds from growing quickly, and lowers temperatures for your plant roots. When mulching just keep in mind that you may need to add extra nitrogen to your soil. Composting is a great way to amend the quality and texture of your soil. Compost adds vital minerals and nutrients to your soil, while also allowing your soil to hold moisture while still remaining aerated. Rain barrels can be used to collect rainwater for your garden. You can then use this water during dry seasons. This is a nice way to take advantage of what nature already provides. While water meters won’t change the growing environment for your garden, they are helpful in letting you know if your garden needs to be watered more or less. Rain gauges can also help to let you know how much water your garden receives when it rains, and if you can skip watering during rainy seasons. Do you have any watering tips or tricks? Share below!